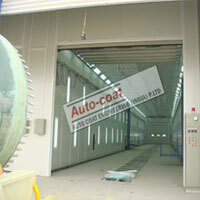 Autocoat Large Paint Booth is designed with the Side Draft Air flow (for medium sized component) is popular because of lower initial cost & lower operating cost. 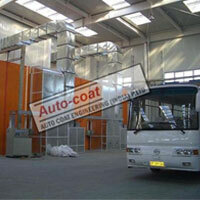 Autocoat Dry Type Large Paint Booth incorporates metal baffles & replaceable filters as per Autocoat 4 level filtration to exhaust paint free air in the atmosphere to full fill pollution norms. 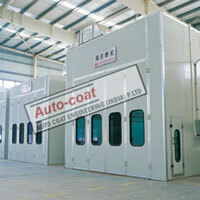 Autocoat Dry Type Large Spray Booth with improved 4 level filtration system reduces recurring filter replacement cost to amazingly low when compared with competition. 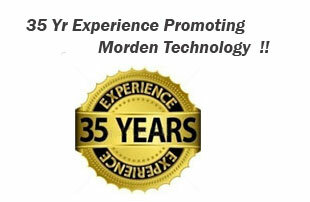 For bigger components like Rail Coach, Earth Moving machineries Dry Type or Wet Type, Truck paint booth OR Rail Coach Painting Booth can be selected as per painting consumption & type of paint required. Large Paint Booths are recommended for painting of heavy parts and large components, like wagons, chassis of vehicles, trailers, etc. In a LARGE PAINTING BOOTH In which Air flows from top to bottom or in a Cross Flow Paint Booth Air Draft is from one top corner to other end of the Paint Booth.